Conan is back, but is he just wandering? 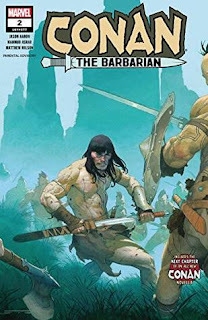 This is a decent sequel, a frontier story pitting Conan against the civilized soldiers at Fort Velitrium, a tribe of savage Picts, and a horde of monstrous giant serpents. It’s a representative Conan tale with good art; it demonstrates his ability to lead, and to be conflicted (as much as a barbarian is) about what it means to be a barbarian vs. a civilized being. The Hocking Story is similarly decent but disjointed. Certainly, it is cool to have a short story as part of the comic, but it is not associated with the illustrations; "Black Starlight" continues with three more pages of prose with Conan and his crew checking out the ghost town they stumbled on previously. On the one hand, it was neat to see a call-out to the emerald lotus (Hocking's pastiche), but... motivations of the band were murky before and this episode did not clarify much, nor did require anything mentioned in the first episode. Enjoyable but less promising. I bought #3 since I have hope for this and the art is well done. I hope it stays on track and builds on these.